Network administrators are responsible for implementing and maintaining IT network systems. The duties usually found in a network administrator resume include diagnosing company network issues, managing hardware inventory, and creating documentation. In a second, you'll see an ideal resume for network administrator positions. In less than 5 minutes you'll know how to write one yourself. You just found a $100 bill. Earning that much per hour as a network administrator. Add benefits, profit sharing, and free food, and you're in systemtopia. Those jobs exist, but it takes a rare network admin resume to bag them. A network administrator resume example better than 9 out of 10 other resumes. How to write a network administrator resume that lands more interviews. Tips and examples of how to put skills and achievements on a network administrator resume. How to describe your experience on a resume for a network administrator to get any job you want. 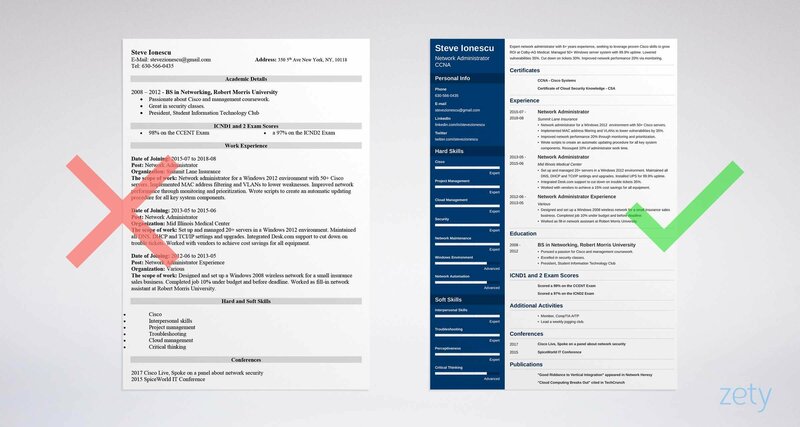 Here's a sample resume for a network administrator made using our resume builder. What's the Best Format for a Network Administrator Resume? Let's say you meet a hiring manager. She's looking for a network admin, and the pay is through the roof. You've got 30 seconds to convince her. So, you kick back, light a cigarette, and say, "I've led a long and fascinating life." You must get to the point at 5G speeds. So, pick the reverse-chronological layout. It's the best network administrator resume format. Why? Because it front-loads your best achievements. Use clear fonts (no comic sans). Include white space and big headings to save the manager's eyesight. 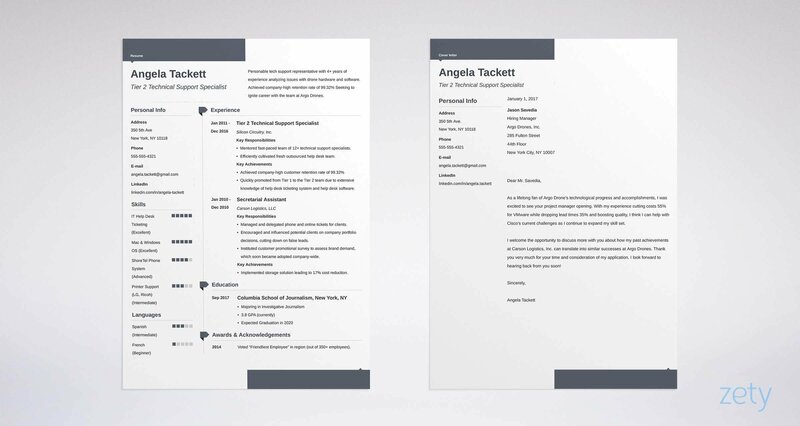 Last, should you save your resume as a PDF or MS Word doc? The old advice says, "Don't submit network administrator resume PDFs." That's legacy wisdom, from back when PDFs weren't machine readable. Today, they're fine unless the network administrator job description says otherwise. Pro Tip: How long should a resume be for a network admin? A one-page resume is usually best. If you've got a ton of experience and need to show it, go longer. Ever seen a rat's nest of server cables that looks like it could eat a pirate ship? That's what most resumes look like to a hiring manager. Clean yours up with a well-written resume summary or resume objective. A resume summary is for applicants with bundles of experience. It shares a screenshot of your network-admin skills. A resume objective is for those with unconfigured work histories. It shows energy and passion. Either way, pack it with enough experience to make Larry Ellison say, "Wow!" Experienced network administrator with expert skills in Windows 12 network management and cloud security. Have worked as a network admin for two major companies. That's not exactly "all your base are belong to us," but it won't drench you in interviews either. Expert network administrator and CCNA with 6+ years experience, seeking to leverage proven Cisco skills to grow ROI at Colby-AG Medical. Managed 50+ servers in a Windows 2012 system with 99.9% uptime. Lowered vulnerabilities 35%. Cut down on tickets 30%. Improved network performance 20% via monitoring and application prioritization. You'd better polish your interview shoes, because you'll be needing them. But what if you have less experience than Mr. Bean? Just let these entry-level network administrator resume samples point the way. Still a junior network administrator with no experience to list on your resume? The experts used to say, "then write a resume objective!" It works by showing passion. Moxie. Chutzpah! But it works better if you add achievements. Entry-level network administrator. Haven't held any network administrator jobs so far, but I did very well in all my associate's degree classes (see education section). Wow. 500 Internal Server Error, right? Energetic network administrator seeking to boost ROI at Colby-AG Medical. Have worked several freelance network administrator jobs. Set up local Windows networks for a small medical firm and an insurance business. Completed work under budget for both time and cost. Zap! The hiring manager is reading your email address. But wait, how did a noob get that kind of system admin experience? Pro Tip: Don't have a lot of experience? Consider getting a CCNA certification from Cisco. It'll port you ahead of all the other entry-level network administrator resumes. How do you prove you're a great network administrator? You show you've nailed it. Your network administrator has to do that if you want to get the best jobs. So, link it to the job description like a T3 line. Proving you can deliver in your bullet points. The senior network admin resume examples below show how. Network administrator for a Windows 2012 server environment with 50+ servers. Managed all Cisco equipment and appliances. Implemented MAC address filtering and VLANs to lower vulnerabilities by 35%. Improved network performance 20% through monitoring and app prioritization. Wrote scripts to create automatic updating procedure for all key system components. Recouped 10% of administrator work time. The hiring manager just spilled coffee on her copy of Network Warrior. Your A+ network admin resume just rocked her world. Network admin for a Windows environment. Used MAC address filtering and VLANs. Installed monitoring and application prioritization. Wrote scripts to create automatic updating procedures. All blah and no bandwidth. Like an active hub that's gone inactive. Don't have them? Peek at the next two junior network administrator resume examples. Nobody will make you the head network administrator with no experience. You can up your entry-level game. Just add experience to your junior network administrator resume. Where can you get experience if you don't have it? Take a few short-term freelance network administrator jobs. Small companies need network help, especially when setting up. Ping local NOCs to see if they need help. Sign up as a student admin with your school's IT department. Sift through previous jobs to see if you've filled network admin duties. Did you install upgrades, add users, or reset routers? Those are network admin tasks. You can list them on a resume for a network administrator. You can even make your own test environment and add that as a bullet point. The next two jr. network administrator resume examples show how. Network Administrator Experience: None yet but I am a really hard worker. Set up a local Windows 2012 network for a small medical business with multiple printers and computers, including remote access for employees and patients. Designed and set up a Windows 2008 wireless network for a small insurance sales business. Completed job 10% under budget and before deadline. Worked as fill-in network assistant at Robert Morris University. Commended by management for efficiency and attitude. At Cheery-B's restaurant, was the go-to for adding users, installing equipment, software, and upgrades, and resetting passwords. Nice. You're an accidental administrator. What achievements can you put in a Windows network administrator resume like that? Pro Tip: Can't find entry-level network admin resume experience? Hunt for freelance work online. Small companies often need help with even simple networking tasks. The system admin world is littered with big degrees that don't amount to much. Your network administrator resume must show your education isn't just a piece of paper. Then read the job description carefully. Find school accomplishments that link to it as if by TCP/IP. See these two sample network administrator resume sections? They target a position that values Cisco, security, and leadership. That's not some generic sys admin. It's Brad Hedlund or Dennis Moore fresh out of school. Now look at the second of our IT network administrator resume examples. Completed all network admin coursework. No wonder you're having trouble establishing a connection. But add a couple details, and you're back up in the Cisco zone. Pro Tip: You don't need a full network administrator degree to write a great resume. A postsecondary certificate or associate's degree does fine in most cases. Remember our hiring manager, Charlene? She cares about your skills to the exclusion of all else. But how does she know you have them? You have to prove them in your network administrator resume. Take a look at these two system network admin resume examples. Wow, look at all those network skills! It's almost like you just cut-and-pasted them from an article. In fact, a lot of people do that. Hiring managers can see through it like S.H.E.I.L.D. 's flying aircraft carrier. But can you really prove you have those skills in a network administrator resume? Let's say the position values vendor management, Windows 2012 server skills, UPS installation, and efficiency. List those in your resume. Add a couple more so you're not pandering. Then you pick your bullet points to match. Set up and managed 20+ servers in a Windows 2012 environment. Maintained all DNS, DHCP and TCI/IP settings and upgrades. Installed UPS to achieve 99.9% uptime across all servers for two years straight. Integrated Desk.com support to cut down on trouble tickets 35%. Responded to all tickets 10% faster than previous admin. Worked with vendors to reach a 15% cost savings for all equipment. Who's this? The guy who wrote the Cisco IOS Cookbook? That's not just a network administrator skills list. It's a ticket to the interview. Use the skills below to initialize the process. Get started with this IT network administrator resume skills list. They all make great network administration resume keywords. Find others in network admin job descriptions on the interwebz. With the plan above, any resume for a network administrator can look like Vint Cerf wrote it. Technical skills for network administrator resumes are changing all the time. Double-check the list above against the job description. Pro Tip: If you're new, level-up your skills with Cisco training. Then apply to smaller companies. You'll be earning an entry-level network administrator salary in no time. The manager will hire you based on your Network+ certification, right? Network administrator certifications aren't the end-all, be-all. But they do add to a network administration resume. That's especially true for entry-level candidates. The CCNA cert is probably the best one in the industry. If you've got it, put it right after your name. Then add it to your summary. Putting your main cert in multiple locations builds redundancy. No matter where the manager glances, she can see you've got the bandwidth. Pro Tip: Want to get your CCNA certification? It looks great on a resume for network administration. Start with the CCENT exam, then take the ICND2. Let's peek in on our hiring manager, Charlene. She's not hiring a robot. She wants experience and education. But she also wants to know your level of commitment. Show her with special "other sections" in your resume. These two Windows network administrator resume examples show how. There's nothing wrong with building labyrinths and liking Daenerys Targaryen. But they don't boot up your network admin powers. Lead a weekly jogging club. Now that's a network administrator you'd want to hire. Even the jogging club helps since it shows leadership and fitness. But with a little configuring, anyone can have an IT system administrator resume like that. Pro Tip: There's no "typical day" for a system administrator. So, make sure your network administrator resume shows lots of different accomplishments. How About a Network Administrator Cover Letter? Should you write a cover letter for a network administrator resume? So many experts say no. That's because most cover letters just say, "Here's my resume." Want to land more interviews? Then don't write a generic network administrator cover letter. Make yours so personal and passionate that Robert Kahn would hire you. Next, show you're synced up with her challenges. Last, share an achievement that proves how you can help. I've read great things about Colby-AG's commitment to networking excellence. I aspire to work for a company that understands how improving networks and security can help the bottom line. I believe my customer-focused approach to systems allowed me to slash vulnerabilities by 35% at Mid Illinois Medical Center while simultaneously boosting performance by 20%. End your cover letter with an offer. Try something like, "Can we schedule a call to discuss network excellence at Colby-AG?" Pro Tip: Think interpersonal skills don't count on a resume for network administration? They're huge. Consider taking an online class or reading a few books on EQ. But did you know to add a well-made LinkedIn profile to your resume contact info? These days, 87% of recruiters use LinkedIn to learn more about job applicants. Make sure yours is up to par. 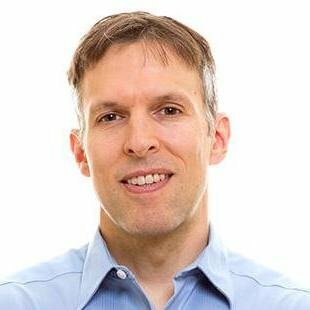 Take it a step beyond your computer network admin resume. That means it has to prove your Robert Metcalf-level network powers. How? See our guide to optimizing your LinkedIn profile here. Pro Tip: Don't let that Dokken vs Slayer argument seven years ago sink your chance at getting hired. Clean up your online presence before recruiters see it. Read the network administrator job description carefully. Highlight all the qualities they're looking for. Cram your network admin resume bullet points with achievements. Make sure they match what's in the job offer. Add "other" sections that show you fit the job like Star Lord's mask. Those can be publications, conferences, or CCENT exam scores. Do you have questions on how to write a great resume for a network administrator? Not sure how to describe your skills or achievements? Give us a shout in the comments! Let's start the conversation.